Trisha has worked with ARCSA since its first national conference in 2003. Trisha served as a regional director in ARCSA's early years, hosted the national conference on the Big Island in 2007 and has provided guidance and support in the development of many of the educational efforts of ARCSA. 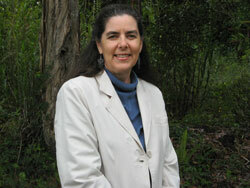 She wrote the "Guidelines on Rainwater Catchment Systems for Hawaii" in 1999 and around 35,000 have been distributed. This was the first manual devoted to the health aspect of rainwater harvesting. She organized the Hawaii Rainwater Catchment Systems Association, the first state organization. She has worked on rainwater catchment projects and trained trainers in 3 other countries and has served as an officer on the board of directors for IRCSA for about 5 years and is a lifetime member. Trisha has a BA degree in Biology and Masters in Public Health/Environmental Science; served as a Microbiology Lecturer at the University of Hawaii, Hilo; and, an Analytical Chemist and Rainwater Catchment Program creator at the University of Hawaii, Manoa. She has received the University of Hawaii's Chancellor's Award for outstanding service, State Senate of Hawaii Recognition of Outstanding Service, and the IRCSA - Meritorious Service Award - Exemplified philanthropic volunteerism in promoting rainwater catchment systems as an ecological way of utilizing the world's water.